The Four Forest Restoration Initiative (4FRI) grew out of the aftermath of a particularly catastrophic wildfire in Arizona during the summer of 2002 – the Rodeo-Chediski fire in the White Mountains of east-central Arizona. The fire burned nearly 500,000 acres, cutting a swath of destruction 40 miles wide and costing over $150 million to finally suppress. The event was a lightning rod that drew widespread public attention to the overall health of Arizona’s forests, to the fuel loads that had accumulated during a century of aggressive fire suppression, and to a changing climate bringing long-term drought and increased bark beetle infestations. Reducing the risk of subsequent catastrophic wildfires – as well as protecting valuable timber and habitat, preserving water quality, and safeguarding critical watershed functions through forest health improvements – became a high priority for Arizona. Map Credit: The Nature Conservancy. A broad, landscape-scale, public-private partnership to address forest health emerged in the form of the Four Forest Restoration Initiative. 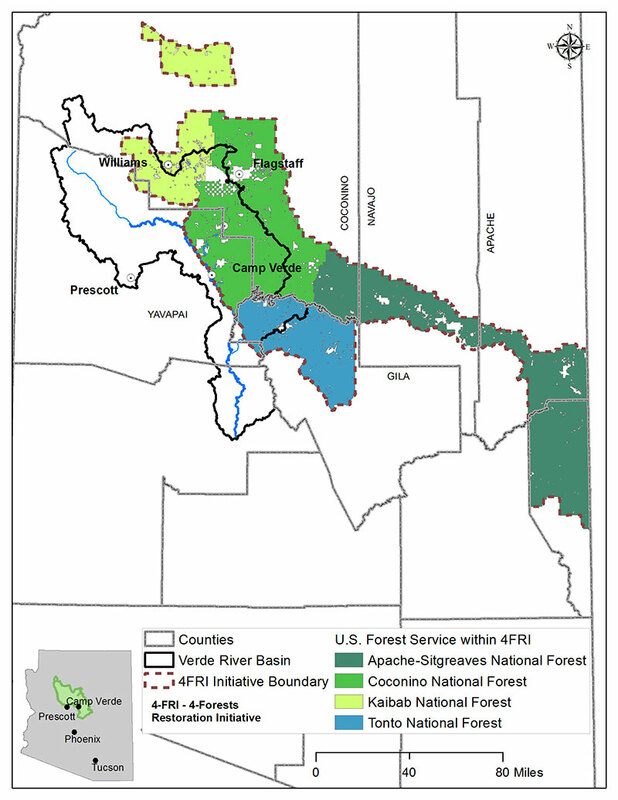 It birthed an ambitious plan for forest health restoration on four National Forest units in Arizona – the Kaibab National Forest, Coconino National Forest, Apache-Sitgreaves National Forest, and the Tonto National Forest. All four of these forests are primarily ponderosa pine forests, and all sit adjacent to each other along the Mogollon Rim in north-central Arizona. The 4FRI plan sought to implement restoration treatments on 2.4 million acres within this geography, with a goal of treating 50,000 acres per year through partnerships with the private sector. It also includes a treatment regimen of prescribed burns, defensible space programs for property owners near forested lands, and thinning projects to reduce small-diameter brushy thickets of trees that foster high-intensity fire. It is estimated that the 4FRI initiative will result in a number of benefits to watershed health in addition to forest health. To date, over 3,000 acres of watershed health improvement restoration projects have been completed under the 4FRI program. According to reports by the USFS, 4FRI projects have reduced evapotranspiration by 10% to 20% through the removal of brushy thickets of small diameter trees by thinning efforts. This has also increased groundwater recharge and water yield by an estimated 1 to 3 inches per year. It is also understood that healthy, robust forests provide adequate shade to slow the melting of snowpack, sustaining watershed flows for longer periods during the spring thaw. Thinning projects may also reduce the risk of future catastrophic wildfire and the associated impacts of runoff and sedimentation in watersheds. The latter includes water quality concerns and the cost of dredging out reservoirs or treating drinking water supplies. While the 4FRI initiative was started with ambitious goals and grand plans, there have been a handful of hiccups along the way, and the progress in reaching the plan’s goals has been slow. While collaboration with all the stakeholders has provided some strength to the initiative, including buy-in from business representatives from the timber industry, conservation groups, and local jurisdictions, the federal NEPA process to approve the 4FRI plan has been a source of frustration for the participants. There have also been stumbles related to the award of contracts to the private sector to conduct 4FRI thinning projects; these primarily surround the limit on the diameter of timber that can be harvested under 4FRI, and the scope and scale of the thinning efforts. This has led to mistrust among the stakeholders, and skepticism that 4FRI’s ambitious goals can be attained. As with any process where multiple, diverse stakeholders are included in the effort, there is a chance to place this collaborative initiative effort back on track. Leadership changes within the USFS have opened new doors to rebuilding confidence in the 4FRI vision. The collaboration has recently conducted an assessment on the success of its efforts that was facilitated by Northern Arizona University’s (NAU) Ecological Restoration Institute. In its report, NAU noted that the true measure of the success of the collaborative effort would be the accomplishment of the stated goals of the collaborative. In the case of 4FRI, this involves something beyond the capability of the stakeholder group – namely, the establishment of a locally-based, sustainable timber industry with the capacity to accomplish restoration goals. In terms of supporting watershed protection goals, the 4FRI initiative is succeeding on some levels, but not quite meeting its stated goals in other areas. One opportunity is to work more closely with community partners, particularly local economic development officials and county and municipal jurisdictions, to explore the possibility of supporting businesses that have the potential to meet the lofty restoration goals for thinning small-diameter timber laid out in the 4FRI plan, while also creating economic benefits – and jobs – for local community residents in rural areas. Indeed, seeding many smaller, entrepreneurial operations for small diameter wood and awarding more small-scale, locally-based contracts – rather than a handful of large-scale contracts for treating thousands of acres – might allow the 4FRI initiative to both see more success on-the-ground with restoration of forests, and support a broader base of sustainable economic activity for rural Arizona. It is worth considering … and the engagement of active citizens and local jurisdictions could help outline a road to that positive result.